Database Maintenance Tools For Act! 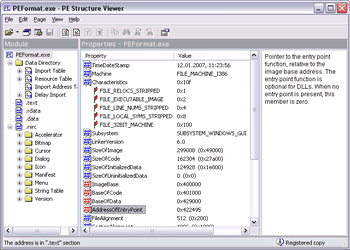 PE Structure Viewer is intended for displaying the structure of 32 and 64 bit executable files in the WindowsÂ® family of operating systems. These files are known as Portable Executable (PE). Some of the structural elements, especially resources, can be seen in a human readable form. Other elements are available only in a hexadecimal viewer, which has incremental searching, bookmarks, Unicode support, data block copying/saving, "Text Only" mode, and a data interpreter. Besides these, the program allows you to browse running processes and DLLs they have loaded, browse all currently registered shell extensions and COM servers, browse loaded drivers, open in-memory images, open non-executable files for displaying them in a hexadecimal, textual or graphical form. The program supports BMP, ICO, EMF, EMF+, GIF, JPEG, PNG and TIFF image formats. An integrated text viewer has incremental searching and supports ANSI/Unicode text and RTF. If you work with the Registry regularly, the possibility of quick jumping to the Registry key indicated in the text file	can prove useful to you. The other tool named String Finder shows all strings found in the file, and allows you to quickly find strings containing a given substring. PE Structure Viewer is FREE for non-commercial use.